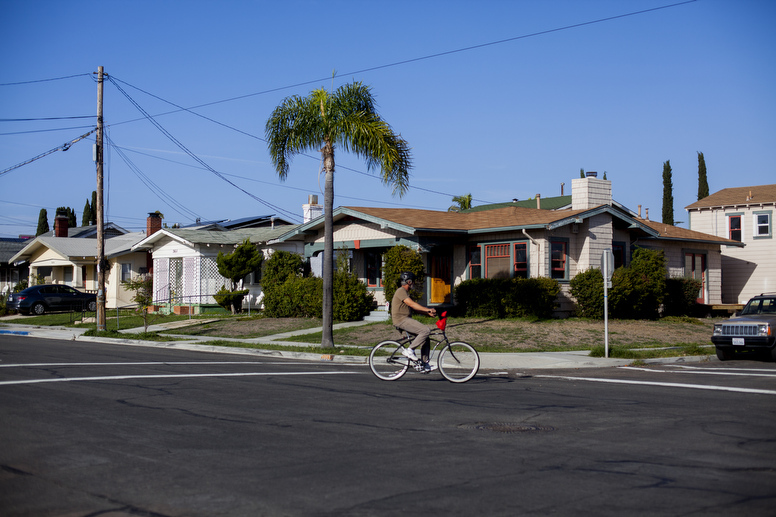 [img]https://www.voiceofsandiego.org/wp-content/uploads/2015/06/craftsman-002.jpg[/img]A cyclist passes homes in North Park. / Photo by Sam Hodgson When housing advocates want to drive home how badly San Diego needs homes for middle-income families, they point to a grim statistic. “We built 33 units for middle-income San Diegans in seven years,” Assemblyman Todd Gloria said earlier this month during a [url=https://www.voiceofsandiego.org/topics/news/vosd-podcast-live-definitely-not-a-2020-san-diego-mayoral-debate/]live podcast[/url] with Voice of San Diego, citing [url=https://www.sandiego.gov/sites/default/files/housing-inventory-annual-report.pdf]a city report[/url]. “That’s the problem.” That number represents less than 1 percent of the production target set by the state. But there’s another problem: That absurdly low number is also wrong – and it underscores not just the desperate need for homes, but the lack of accurate data on how many homes and apartments builders are producing for middle-class San Diegans, numbers that would help policymakers assess the severity of the crisis and shape discussions about solutions. After Voice of San Diego raised questions about a Kearny Mesa project factored into the total in the city report, David Graham, a deputy chief operating officer who oversees city housing efforts, confirmed that 29 of the 33 units cited in the report shouldn’t have been included. That means, according to the city’s methodology, just four middle-income units – units for managers living in two low-income housing projects in East Village and near 4S Ranch – materialized in the past seven years. Graham said the 29 other units were mistakenly included in the tally because developers of the Kearny Mesa complex initially planned to sell moderate-income units to comply with a city policy but later opted to rent the units to low-income San Diegans. The city’s annual review of housing data for state-mandated annual housing plans and the longer-term Regional Housing Needs Assessment process didn’t uncover the problem. Even setting aside the inaccuracy, the report was limited in scope, further narrowing the usefulness of the data. The review wasn’t based on actual middle-income units that were built. Graham and Scott Marshall, a spokesman for the San Diego Housing Commission, said the number of middle-income units in the report only represents units produced by developers who made agreements with the Housing Commission to offer rents affordable to families making 80 to 120 percent of the area median income. That would equate to an annual income of about $78,000 to $98,000 for a family of four. Agreements to hold rents at middle-income levels are rare. They are often reached, however, with developers building affordable housing. Conversations about the need for more housing that’s accessible to low-income San Diegans, including the city’s booming homeless population, have for years dominated local policy debates about housing. But business leaders and housing advocates, including some who primarily lobby for low-income San Diegans, are increasingly saying that the city and the region must also do more to increase homebuilding for middle-income San Diegans. A slew of leaders from Gloria to Mayor Kevin Faulconer have argued the lack of development for middle-class San Diegans has left those residents struggling to pay the rent and afford homes, and made it [url=https://sdchamber.org/wp-content/uploads/2018/06/Housing-Study-NR-6.26.18.pdf]more difficult for local companies[/url] to attract and retain workers. Some affordable-housing advocates say the lack of middle-income production has also meant middle-class San Diegans aren’t moving out of apartments that might otherwise be available for lower-income people. The calls for more and better data about housing production come amid discussions about proposed city policy changes to [url=https://www.voiceofsandiego.org/topics/land-use/progressives-eye-policy-that-delivered-small-amount-of-affordable-housing/]incentivize or even force housing development[/url] for low-income and [url=https://www.voiceofsandiego.org/topics/government/a-major-piece-of-faulconers-housing-plan-is-on-hold/]middle-class San Diegans[/url], and similar conversations playing out in Sacramento. “We don’t really know what the numbers are and we’ve got to get our arms around this,” said Mary Lydon, who leads Housing You Matters, a coalition that includes a broad swath of groups from the Chamber of Commerce to affordable-housing developers. The coalition last week tasked a committee that includes a former Housing Commission executive and the president of the Building Industry Association with analyzing how to better track middle-income housing production going forward. Graham said city officials are recognizing their processes and the conservative approach they have taken with annual reports to the state and regional planning agency don’t provide adequate information on middle-income housing development. They are now looking at how they might seek more granular data and to increase transparency around the numbers they include. “We’re committed to getting better data on moderate-income production,” Graham said. “It’s gonna require other resources and support from people that are building these units and I think, potentially, some academic support.” Officials with the state’s Department of Housing and Community Development confirmed their rules for reports that cities must file allow for more in-depth moderate-income production surveys and analyses than San Diego officials have historically conducted. Borre Winckel, the BIA president serving on the Housing You Matters committee set to dig into the data, said more accurate numbers are crucial to driving solutions. “I think for far too long we’ve allowed ourselves to be driven by anecdotal and imperfect information,” Winckel said. Winckel said he suspects more middle-income units are coming online each year than the city’s current methodology reveals. Calculating middle-income production numbers requires monitoring whether projects going up around the city offer rents or go on sale at prices that are affordable to middle-income San Diegans, something the city and local groups largely haven’t tried to do. Russ Valone, a real estate analyst who leads San Diego-based MarketPointe Realty Advisors, did a quick analysis of MarketPointe data using that method for VOSD and estimated that just under 2,000 rentals produced from 2016 through this September could be considered moderate-income units – far more than the city’s review suggests but still far short of state-set targets. Valone’s review did not include for-sale properties. “I would still say that we have a problem in moderate housing production but nowhere near as critical as the few data points that have been pushed forward,” Valone said.